This page provides information on my Prius generator project, which is a system to utilize the battery and charging system of the Toyota Prius to provide power for the home during emergencies. First off, this isn't my idea, just my particular implementation. Full credit for the idea and research for this project goes to Richard Factor (www.priups.com). Please visit his site if you are interested in all the details. Disclaimer: This project involves high voltage and other potentially dangerous activities and should not be attempted by anyone unless they know what they are doing! 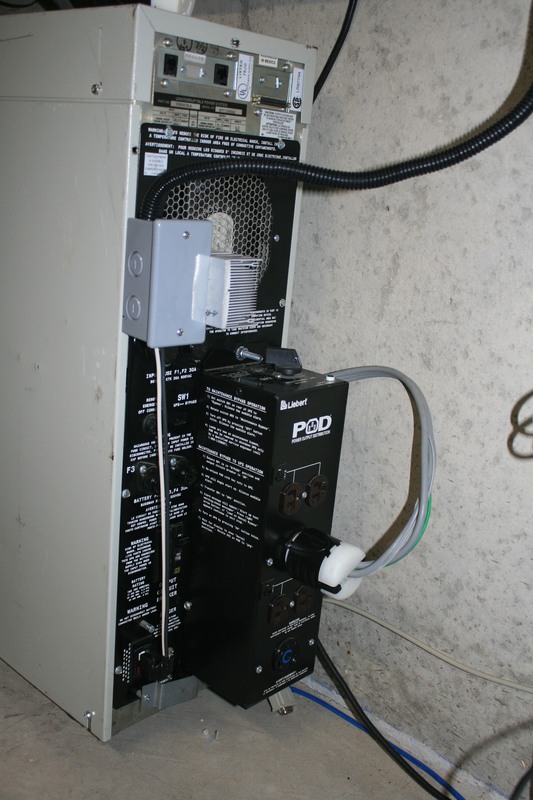 As an introduction, the system utilizes a large Uninteruptable Power Supply (UPS) to deliver power to the house via a transfer switch. UPSes are designed to operate on batteries for a short period of time during a power outage, giving time to shut down devices orderly. However, if you were to augment the internal batteries with the battery of the Prius, then you could keep the UPS running for as long as you have gas in the Prius. So, the goal of the project was to find a suitable UPS and to hook it up to the battery of the Prius. Well, in order to get power from the Prius, the first thing that is required is access to the high voltage traction battery. 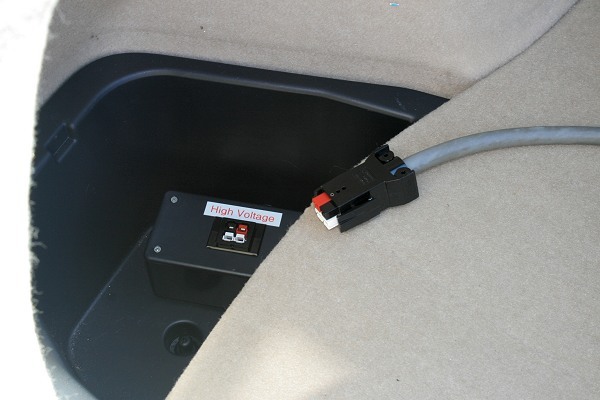 This is achieved by connecting to the high voltage battery leads in the trunk. I did what other people have done, and that is to bring it out to the driver side storage bin in the trunk. There's got to be a better way to get the battery cord out of the car! Here's a view of the battery cord stored on the junction box. The cord is 12 gauge stranded wire, but from the junction box to the UPS, it's 10 gauge Romex. This runs from the garage to the basement where it connects to the UPS. 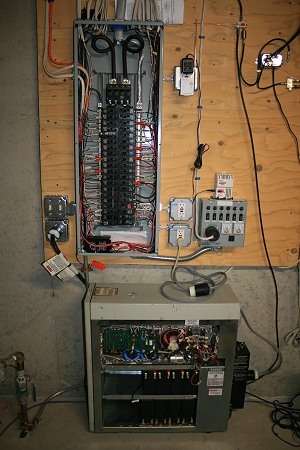 This is an exposed view of the UPS and load center panel during initial wiring. The battery wiring from the garage has not yet been run in this picture. The UPS is a Liebert UPStation S 6KVA unit that I managed to get on ebay for $295 shipped. The batteries were shot, so I had to buy new batteries for another $184 shipped, so my total cost for the UPS was $479. The original batteries were 16 pieces of 12V 12AH units but I replaced them with 7AH batteries, as runtime wasn't an issue and they were considerably cheaper. You can see that they occupy less space than the original batteries in the battery bays. The UPS consumes about 200W in idle mode, so leaving it on standby continously wasn't an option for me. However, since the unit would not start up without 240V input power, I needed an alternate means of starting it. I settled on using my gas generator to start it. 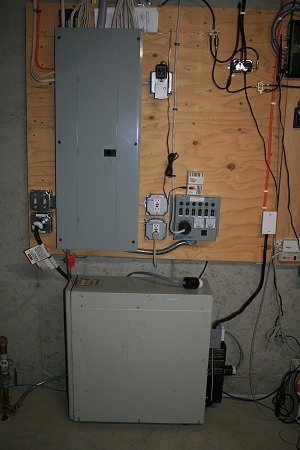 You can see an existing generator transfer switch on the right side of the panel that is normally connected to the generator. 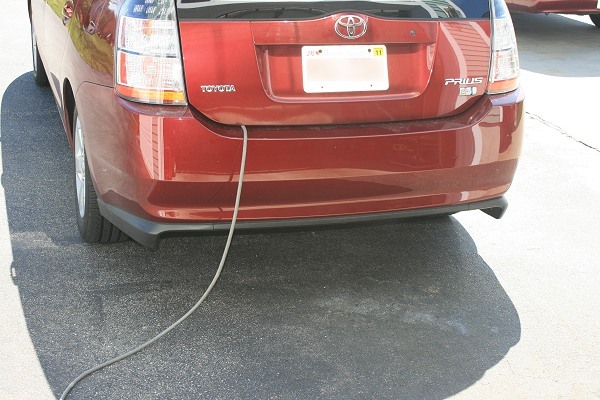 When I first loose power, the idea is to first fire up the gas generator until the Prius makes it home, and/or then use the generator to start the UPS. The UPS 240V power outlet on the left of the load center is wired to two cutover switches above it that can switch it from it's normal circuit breaker to the 240V from the generator. Once the UPS is started and connected to the Prius battery, input power can be disconnected and it will now be running on battery. At that point, the input to the transfer switch is switched over to the UPS output (manually via L14R20 plugs), and the gas generator can then be shut down. This is a picture of the completed and closed up system. You can see the orange Romex carrying the battery connection coming down on the right side of the picture. 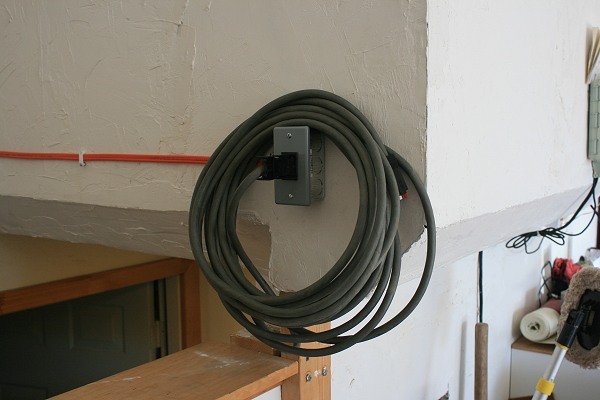 The white junction box just provides a way to switch to flexible wires. Here's a close up of the diode and heatsink, which was mounted where the UPS fan could provide cooling. There is also an inline fuse inside the junction box. I ran out of 10 gauge cord wire, so I used solid wire from the box to the extension battery connectors at the bottom. So, that's it. That's the whole system. It works well. Although I have a 6KVA UPS, my regular loads are less than 3KVA, so it's running very much below it's limits. The battery voltage at the UPS varies between 210V and 245V when connected to the Prius, which equates to 2 and 3 bars respectively on the Prius display. I had some concerns that the high voltage might cause the UPS batteries to overcharge and start to gas, but it is at that high voltage for less than 30 seconds before the engine shuts off and the voltage starts to drop. At my normal consumption, which is mostly computers, furnaces, entertainment system, lights, etc, the Prius runs a 23-33% duty cycle. Charging seems to take about 2 1/2 minutes and discharge times vary from 8 to 5 minutes, depending on the load. On October 29th, 2011, an early winter storm took out power for almost 2 full days. The Prius generator performed flawlessly, and consumed about 5 gallons per day, which was a lot less than a normal generator, but still a lot more than the grid.